Has led his teams to over 400 wins His teams have averaged 23.3 wins per year in his 18 years as head coach. All of this after taking over a program that had won just six games before his arrival. He has led O’Connell to 5 Virginia State Independent Titles, 3 WCAC Regular Season Titles, 4 Alhambra Catholic Invitational Titles, and 2 WCAC Tournament Title in the past 14 years. Selected as the Arlington County Coach of the Year three times, WCAC Coach of the Year once, and Virginia State Independent Coach of the Year three times. 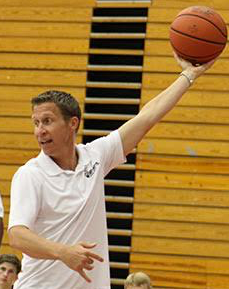 He has helped develop one college head coach, six Division 1 assistant coaches, and six high school coaches. 45 of his former players currently play or have played college athletics. Former assistant at Division I Furman University. Named by Washingtonian Magazine as one of the “100 people to watch” in Washington. Has spoken at clinics throughout the country. Played and started at DeMatha on a team that posted a record of 30–0 and finished the season ranked No. 5 in the country. Five of his former players have played professional basketball overseas, and one is currently in the NBA. Co-Chairman of the McDonald’s All-American Basketball selection committee. Member of the Adidas Nations Coaching Staff.